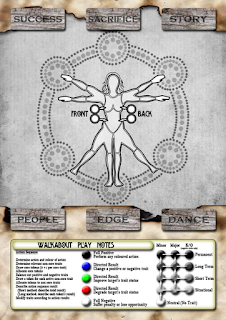 Walkabout is't one of those games where all of the rules fit on a single sheet; that might be an admirable design objective, but there are simply too many nuances in the game to handle a single side of a single page. On the other hand, I do like those sets of miniature rules where a "cheat sheet" provides all the core information to help a new player get started (and to remind veterans of the basic rules without forcing them to open up a dusty tome). In a typical Walkabout story, the Wayfarers come to a dangerous part of the world. This is a place where the spiritual energies of the world are out of balance and only the Wayfarers are able to restore the natural order of things. The Wayfarers need to see the problems in the world, understand what is causing them and find a way to resolve both the symptoms and the deeper issues. In some stories the Wayfarers will face ethical dilemmas on their paths, at other times they’ll argue with one another about the best course of action, they’ll frequently face fearful and superstitious denizens of the world and quite often they’ll be forced to make difficult decisions that require a sacrifice in order to succeed. When the sheltered communities of the underground emerged after a century of self imposed exile, they needed a quick and secure method for marking territory to one another. Unable (or unwilling) to use their high tech gadgets, except for short bursts of computing power, they've taken to spraying an ancient form of coding on the roads, just beyond the outskirts of settlements. When one of the sheltered approaches a settlement that has been visited before, they pull out a handheld computer, activate it for a few seconds to analyse the markings on the ground and then determine if it is safe to proceed into town. I'm thinking about making a deck of cards using these markings, to make the game a bit more interactive and immersive for the players. 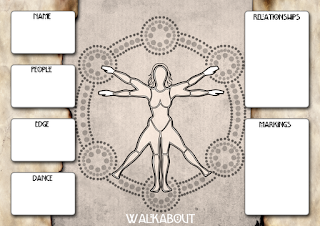 Character generation in Walkabout is simple (whether those characters are wayfarers controlled by the players or the other survivors they interact with), spirit generation is also simple. While spirits and survivors are incredibly different beings, their creation methods follow the same basic structure. Each consists of three core traits. Beyond these core traits, individuals have a range of positive and negative non-core traits that modify the chances of success in various situations. 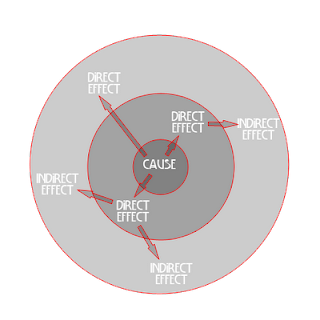 No numbers, just descriptive terminology, strategic modifiers and in-game items that tie into the story as it's being told. In Walkabout, a zombie is something more than just a shambling infected undead, it draws its power from the legends that spawned it. To defeat a zombie, the wayfarers need to learn how it spawned otherwise the simple defeat of the monstrous menace will lead to it respawning quickly. To defeat a zombie, one must learn of Voodoun, the Loa, the way dark spirits ride the living, and the rituals used to reanimate the dead...or at least watch a whole lot of zombie movies. The power of focused belief comes from the esoteric, but the deluded belief of the masses carries a lot of weight as well. The movies and stories from the pre-tilt world have instilled the spirits associated with the concept of "zombie" certain consensual traits. When they infect one of the living, they become "susceptible to head shots" and in parts of the world where more traditional zombie beliefs are still upheld, they may become unable to cross lines of salt. I've just been alerted to this table. It's really clever and inspires some great ideas. I like 5, 12 and 20, but the whole table has given me ideas for randomly generated low-sentience spirit entities in Walkabout. The next range of illustrations for Walkabout. Like the first images interlude, these are mostly the type of atmospheric moody pieces that I'm actually trying to get away from. The bottom picture with the argument is getting closer to the type of things that I hope to have more of...images that describe relationships between people (whether they are in stressful situations, looking out for one another, or simply engaged in group activities). There is a fracture between the OSR and the Indie factions within the roleplaying community. It's been around a while and I've even commented about it a few times on this blog. In the old days we divided the RPG community into "Roll"-players (who were all about the mechanisms and the dice), and the "Role"-players (who were all about the characters and the story). In the circles where I associated, the "Roll"-players were inferior; they were a throwback to the wargamers, they didn't get into the actual spirit of the game...instead they just sat back and kept asking the GM "Is it my turn to roll? What do I roll now? I got a 6, what does that mean? "...while the "Role"-players got into the funny accents, the cultural portrayal of races and almostfelt that the game fell apart once a GM decided a die roll was necessary. The Walkabout world is similar to our own, but it has two drastic changes (and these changes lead to a cascade of lesser changes). The first change is the tilt of the planet, this has been discussed fairly extensively in the first posts of this series. The second change is the manifestation of the spirit world in the physical plane, this has been touched on but hasn't really been detailed. In some of those early posts it was even said that the nature of spirits either remains unknown, or isn't really important to the objectives of the characters within the setting. This was an oversimplification to allow us to progress with the other description that help set the scene for the stories within the Walkabout world. I don't know how many walkabout images I've posted here on the blog, but I've got about 40 of them in various states of completion. I'll intersperse a range of images here and there throughout the remainder of my descriptive posts about the setting. More than half of these images are people I know, or gamers who have kindly permitted me to use their images as post apocalyptic survivors in the setting. To make things easier for everyone to search through some of the more popular series of posts on this blog, I've added a range of quick link pages. So far I've included pages for "Walkabout", "Hell on Eight Wheels" and my "Game Mechanism of the Week" Series (this last one's in progress). You can see them up at the top of the page. I’ve looked at the science and pseudo-science of the Walkabout from a few different angles; so at this point you’re either going to run with the suspension of disbelief that spirits could awaken in our world and that the shifting magnetic poles could cause the world to shift t’s rotational axis could, or you’re just going to call it crap and move on to another setting with a series of fantasies that you can believe in. Beyond this point, it’s less about hard science and more about anthropology, and the projection of history into the future based on the actions of the past…and a bit more spirituality.